For the all round player; field or corner. The Gryphon Taboo Pro has had its genes firmly embedded in our niche performance category for many years now. The passion behind the ultra-premium composition and lay-up, refined Gryphon Pro Mould cut and feel is unmistakably Taboo. This stick is crisp from its first pick-up to its last ensuring explosive power for life. It is a low-bow design that will suit corner specialists and field players alike. For the all round player; field or corner. The Gryphon Taboo Pro has had its genes firmly embedded in our niche performance category for many years now. The passion behind the ultra-premium composition and lay-up, refined Gryphon Pro Mould cut and feel is unmistakably Taboo. 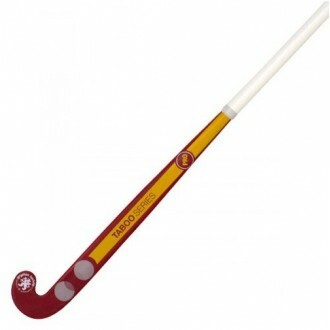 This stick is crisp from its first pick-up to its last ensuring explosive power for life. It is a low-bow design that will suit corner specialists and field players alike.